This two-door Chevrolet Impala hardtop is one of about ten American cars from the 1950s and 1960s ending their lives on the outskirts of Salt Lake City, Utah. The cars look like they have been there for decades and all of them are fairly complete with the exception of license plates, leading us to believe that they were stashed away to claim insurance money. We’re admittedly not experts on vintage Chevrolets but several readers told us on Facebook that the Impala pictured below was built in 1963. It is fitted a front bumper guard, a rare accessory, but we don’t believe that it’s a sought-after SS as it doesn’t appear to have the holes on the fenders for the flag emblem that were affixed to the range-topping models. That said, someone better-versed than we are in vintage Chevrolets will undoubtedly correct us if we’re wrong. The carburetors and the intake manifold are gone, likely removed shortly after the car was dumped, but the rest of the drivetrain is intact and most of the interior is still in one piece, though it is heavily deteriorated. 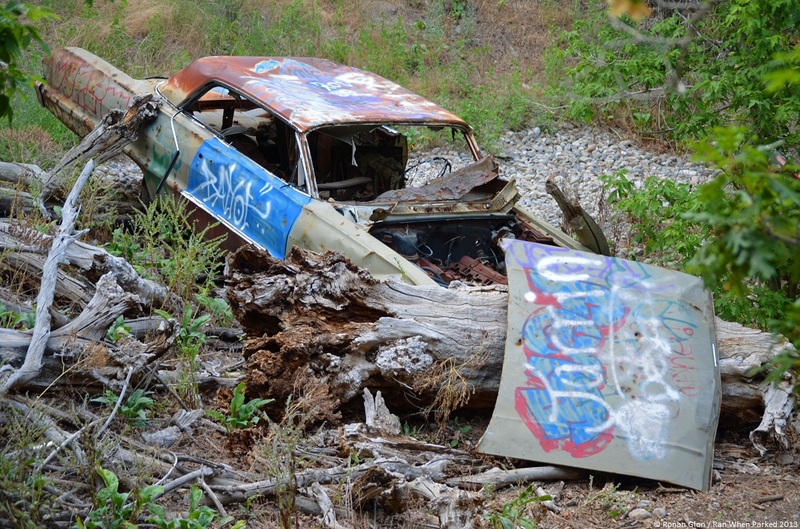 Over the numerous years that the Impala has spent in the wild, it has been smashed with rocks, shot at and graffitied, leaving it in sad and unsalvageable stage state today. That’s a ’63 for sure and it looks like it has a 250 hp 327. Give me an hour alone with it and I’d walk out with the grill guard, single remaining rear bumper guard, power steering brackets and as much of the AC as isn’t destroyed. And the tilt column. It looks like it was a well optioned car. You are correct that it isn’t a SS but it should have had a V shaped emblem with crossed flags above it just behind the front wheels indicating that 327 was in it. Good eye on the engine. I didn’t realize grille guard was sought after, lots of people have mentioned that. I happen to live on the out shirts of saltlake city and have legally rescued several classic cars from returning to the earth whereabouts outside of salt lake are these cars located?